Unfortunately, even though I had a truck, I missed out on the Forest City Flea again, for the second year in a row, in addition to the Hyde Park Garage Sale, an annual event in my area where 150 homes in Hyde Park have a neighborhood wide garage sale. Didn't even know about this until yesterday when I saw a flyer in the mail. It took place on Coronation Dr. which is my mother's street and about a 5 minute drive away. Incredibly disappointed about that but I will have to mark it down for next year. 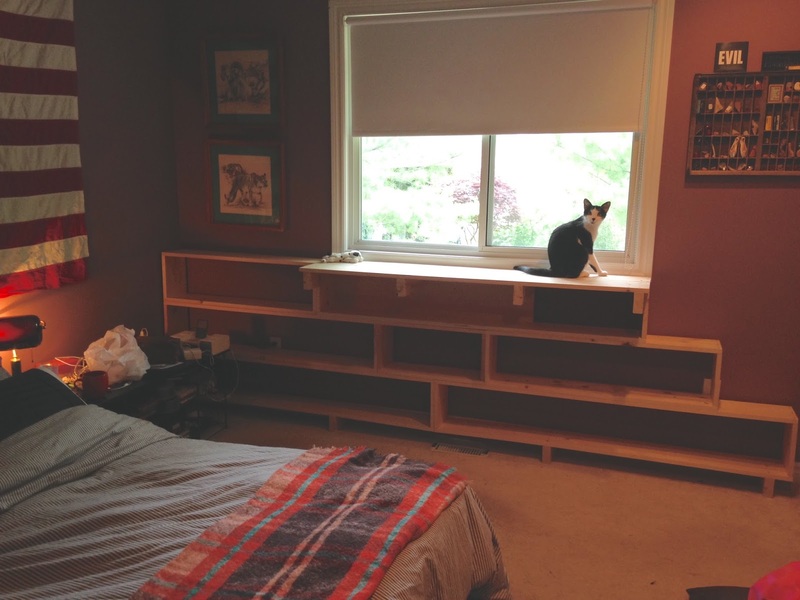 But the shelf that hubby and I designed - the shelf that hubby made - is structurally done! There were a few budget concerns, some minor design disagreements, and lots of troubleshooting, but hubby managed to knock out the construction of the shelf in one day. Or shelves, rather, since the pieces are all modular. On the second day, he simply bolted the thing together in the room and mounted it to the wall. The rest of it is up to me. I have to sand it, prime and paint it, and I'd like to upholster Blixa's self for her so she's not lying on raw pine (update: she is now lying on a throw). But even though it's still technically incomplete, I've already started filling it up. My shoes have a shelf now! I'll keep you posted on updates.